Cast and Crew: Antonio Banderas, Salma Hayek, Johnny Depp, Ruben Blades, Mickey Rourke, Eva Mendes, Danny Trejo, Enrique Inglesias, Cheech Marin, Willem Dafoe, Pedro Armendariz Jr.
What It’s About: An attempt to overthrow the Mexican government comes to a head on the Day of the Dead in this sequel to Desperado from writer/director/producer/cinematographer/composer/editor Robert Rodriguez. Why Watch it Today? : Today is the Day of the Dead, the famous Mexican holiday with roots in Aztec culture. Once Upon a Time in Mexico is an action packed romp with a great cast of stars and cult favorites and top-notch action that recalls the Spaghetti Westerns of Sergio Corbucci. 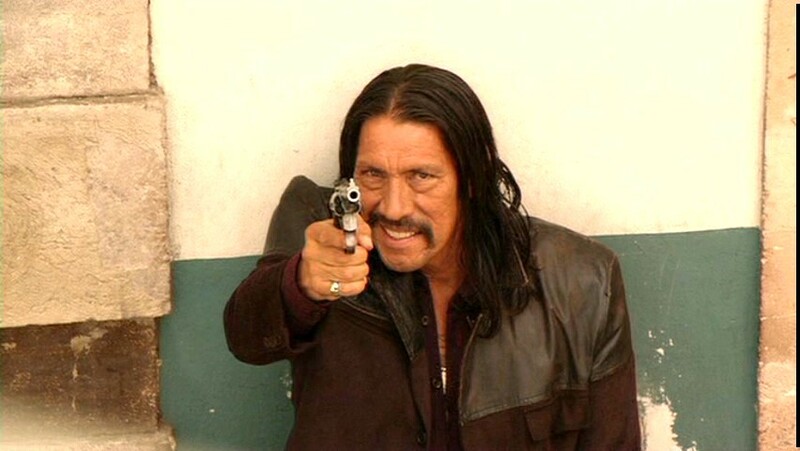 Danny Trejo wants you to donate to Movember. You’re not going to tell Danny no, are you? This entry was posted in Action, Crime, Espionage, Event Film, Hit Man, Indy, Movie of the Day, Sequel, Spaghetti Western and tagged Antonio Banderas, Cheech Marin, children of famous people, CIA, Columbia Pictures, corrupt cops, corrupt politicians, corruption, Danny Trejo, Day of the Dead, Dimension Films, double cross, Enrique Inglesias, Eva Mendes, homage, Johnny Depp, mariachi, Mexico, Mexico City, Mickey Rourke, Pedro Armendariz Jr., revolution, Robert Rodriguez, Ruben Blades, Salma Hayek, Troublemaker Studios, Willem Dafoe.